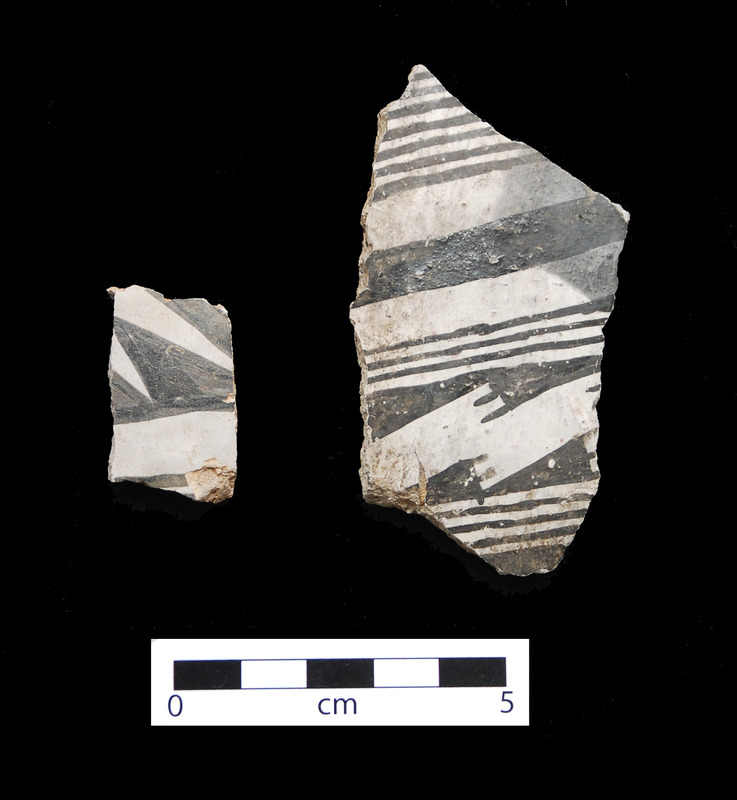 Pinedale black-on-white sherds. Click the image to open the Pinedale Black-on-white gallery. Pinedale Black-on-white is a late type with a more limited distribution that other Cibola White Ware types. Date Range: ca. A.D. 1300-1325. Temper: Sherd and sparse sand. Surface Finish: Shiny white slip; often thick, hard, crackled, and finely polished. Forms: Bowls, jars, pitchers, canteens, ladles, effigies. Paint: Subglaze to glaze; black to greenish black. Design: Mostly solid designs with interlocking elements; solid steps, step frets, and corbelling lines; hatching frequently changes direction within larger motif; elements so closely spaced that designs appear negative. Comparisons: Distinguished from Tularosa Black-on-white by slip and glaze, as well as the absence of Tularosa-style hatching. Designs are similar to Kayenta Black-on-white, which has carbon-based paint.